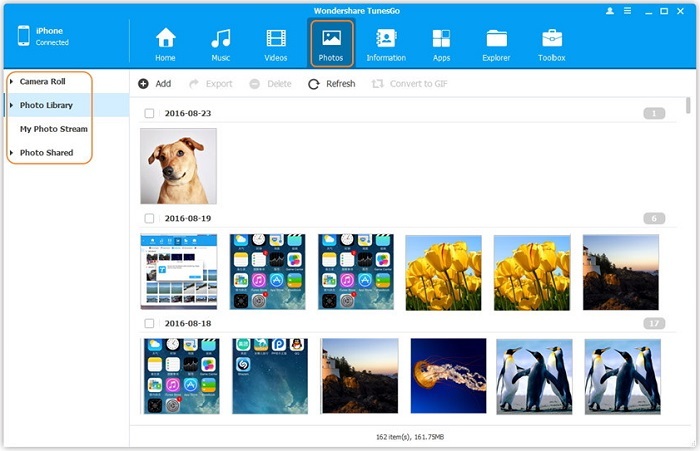 Are you thinking about getting a device manager like Wondershare TunesGo to transfer and organize your iPhone, iPod, or iPad files? Check out the full review of Wondershare TunesGo to learn more about it. You may also want to know some alternatives to TunesGo. Transfer unpurchased files to and from your computer, or files that you purchased on platforms that were not the iTunes store. Transfer files of many different types and formats, even formats that iTunes may have been unable to support. Organize and delete duplicate contacts automatically in an easy to view interface right on your computer. Transfer files one at a time, selectively, instead of having to sync your whole library all at once. Basically, it’s transferring software and a device manager all in one, and it’s fairly useful. 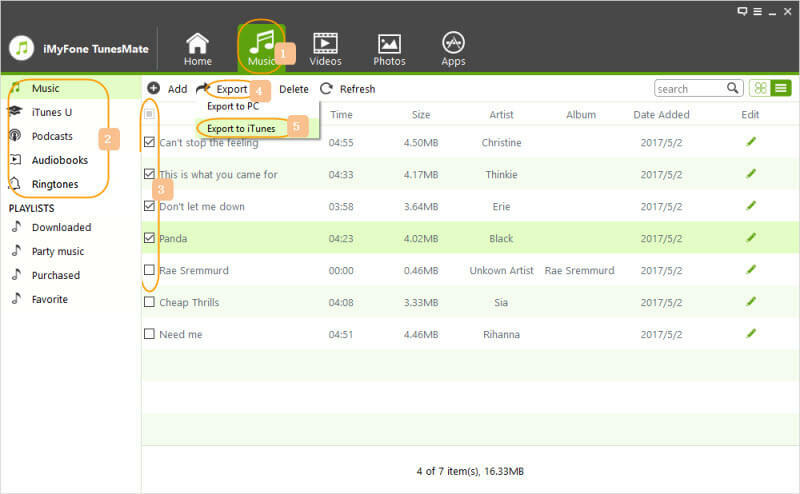 WonderShare TunesGo performed well and is able to transfer files quickly and accurately. The software is fairly easy to use and just about anyone could learn to transfer their files with this device manager. It also did a fairly good job of cleaning up and organizing files and it basically does everything automatically for you. As soon as you plug in your device and launch the program, it’s fairly easy to navigate and see all of the relevant files in your device and computer. Not everything in the interface is labeled, but anyone computer literate could probably figure it out fairly quickly. After you’ve chosen the files that you want, everything is transferred without much trouble. You usually only have to click a few times to get the results that you want. We can easily recommend this software to most people who are looking for a quick and easy device manager. It has very standard features and it’s not particularly fancy, but it gets the job done for what it is. Good interface that is usable for most people. You can get most things done in a matter of minutes with just a few clicks. You can organize files very easily, as well as transfer them. The interface is not as easy to use as some other device managers. You do have to pay for it after the trial. It’s expensive of $49.95 for 1 year and 1 PC. It has redundant features, like uninstalling apps. Its features about Apps are only suitable for iOS 8.3 below. iMyFone TunesMate is a great alternative to Wondershare TunesGo. It functions as transferring software and a device manager, similar to TunesGo, but it has a few enhanced features that make it better. Like TunesGo, it gives you control over your iOS device and helps you get past many of the restrictions that you will find with iTunes. It's highly commended by hundreds of users and well-known media. You can manage and transfer music, movies, podcasts, audiobooks, playlists, camera roll, photo library, iTunes U, TV shows, music video, etc. Transfer files to iPhone from computer/external hard drive/CDs/players/etc, without data loss. 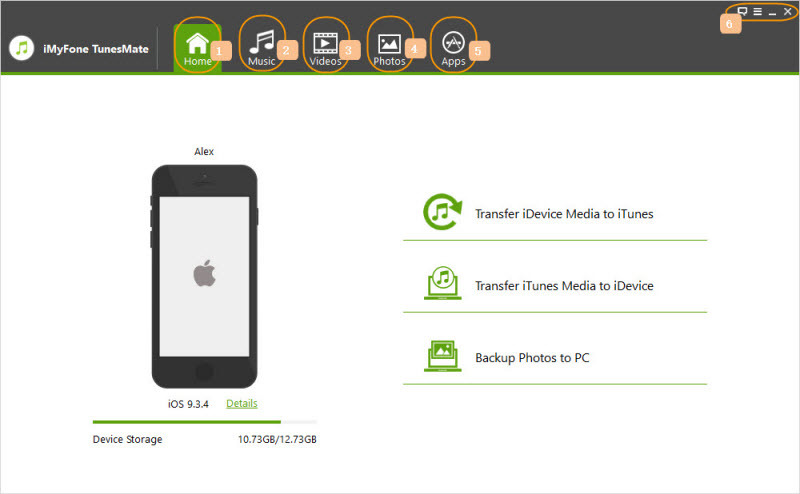 Back up iPhone files and restore backups to iPhone anytime without covering the current files. Two-way sync to transfer iPhone files to iTunes and sync iTunes library to iPhone. Edit your playlist and build your music library without every opening iTunes. Full compatibility - Support all audio & video formats; purchased and non-purchased files; all models of iPhone/iPad/iPod. iMyFone TunesMate is extremely easy to use and has many functions that make it convenient. With just a few clicks, you can transfer all the media in your library to your device, or all the media on your device to your iTunes library. This happens very quickly and it can save you a lot of time if you don’t want to pick through all of your media one at a time. It’s also very easy to transfer files selectively, though. You can transfer from your device to your computer’s hard drive or to your iTunes library without every having to open iTunes. This can be very liberating if you dislike the iTunes interface. Transferring from your computer or your library selectively is also a breeze. Overall, TunesMate is fast and simple to use, so it’s highly recommended even for people who are novices when it comes to using technology. You can transfer nearly any file you like. The interface is super easy to use. TunesMate has tons of features that you won’t find in iTunes. It costs $29.95 if you needs more functions. But it also provides free trial. Specific audio & video formats are supported. As you can see, both TunesMate and TunesGo offer a great alternative to iTunes and make for a better experience. You have more control over your files and your data is less likely to be deleted. However, TunesMate is the ultimate winner here because of its speed and user-friendliness.